Hypertension is the medical term for high blood pressure. A cat is generally thought to be hypertensive when its systolic blood pressure is above 175 mm Hg. Are certain cats more likely to get high blood pressure? In humans, hypertension is related to several factors, including a stressful lifestyle. Although not all causes of feline hypertension have been identified, stress does not appear to play a role in the development of this disorder in cats. However, kidney, thyroid, and heart disease are recognized causes of feline hypertension and will be described in detail. Hypertension is more common in older cats, especially overweight or obese cats. What are the clinical signs of high blood pressure in cats? Abnormalities with vision are the most common clinical findings with feline hypertension. These abnormalities can include dilated pupils that do not constrict with light, blood within the chamber of the eye, and blindness. Blindness develops because high blood pressure in the eye causes the retina to detach. Retinal detachment results in blindness. Blindness is usually noticed when the cat keeps bumping into objects in their path. In some cases, hypertension is suspected because of a heart murmur or liver- or kidney-related clinical signs such as increased water intake or urination, vomiting, and weight loss. Kidney failure and hyperthyroidism have been identified as the two most common predisposing factors for development of feline hypertension. Certain heart diseases can also cause hypertension. Kidney disease – It appears that several different mechanisms may lead to development of hypertension in cats with kidney disease. One theory suggests that as a cat ages, the kidneys undergo normal aging changes, including a slow accumulation of scar tissue. With time, this scar tissue causes the kidneys to shrink in size. When the kidney shrinks, it is harder for the blood to filter through it. Because the kidneys normally receive 20% of the circulating blood with every heartbeat, blood backs up into the arteries and leads to an increase in blood pressure. One study found that about 60% of cats with chronic kidney failure have hypertension. Elderly cats in the early stages of kidney disease are also more likely to have hypertension. Hyperthyroidism – The thyroid gland is located in the neck and plays a very important role in regulating the body’s metabolic rate. Hyperthyroidism is a disorder characterized by the overproduction of thyroid hormone and a subsequent increase in the metabolic rate. This is a fairly common disease of older cats. Although the thyroid gland enlarges, it is usually a benign growth. 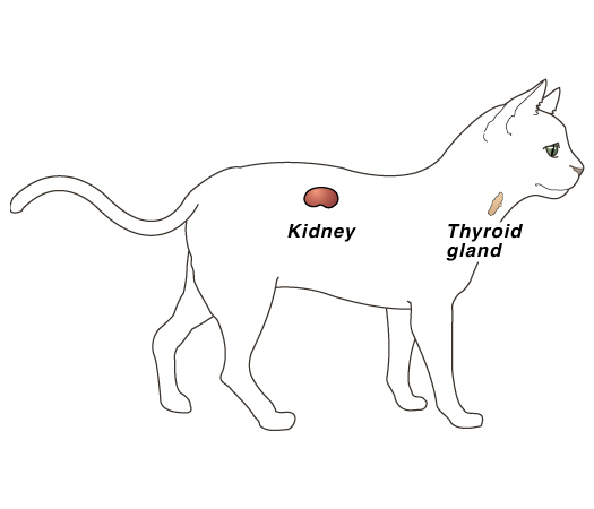 Less than 2% of hyperthyroid cases in cats involve a malignant change in the gland. Many organs are affected by hyperthyroidism, including the heart. The heart is stimulated to pump faster and more forcefully, and eventually, the heart enlarges to meet these increased demands for blood flow. This condition is called thyrotoxic cardiomyopathy. The increased pumping pressure leads to high blood pressure. Approximately 25% of cats with hyperthyroidism have high blood pressure, although most of them do not have blood pressures high enough to cause blindness. Hypertrophic cardiomyopathy – this form of heart disease occurs when the heart muscle thickens and the volume of blood within the heart chambers becomes decreased and the pressure increases. Less blood is pumped with each heartbeat, increasing the demand for blood flow and causing an increase in blood pressure in an attempt to meet the demand. For more details on these 3 diseases, refer to the appropriate handouts in this series. Hypertension should be suspected in any older cat with kidney disease or hyperthyroidism. Onset of sudden, unexplained blindness should raise a strong suspicion for hypertension, and the associated diseases should be considered. The presence of a heart murmur or kidney-related problems may also signal the presence of a hypertensive state. Blood pressure is measured with a device that can detect blood flow in arteries. Obviously, the cat has very small arteries when compared to those of humans. Consequently, the standard blood pressure equipment used on humans will not work on cats. Your veterinarian will discuss with you the simple blood pressure measurement protocol they recommend for your cat. Although there are several drugs that are very effective in treating human hypertension, none of these are approved for use in cats. Research efforts have determined that some of these drugs are effective in cats. Studies are still being done in an effort to determine which drugs are the safest and most reliable. Your veterinarian will recommend the best treatment options for your cat based on its specific needs. What is the prognosis for hypertension? The underlying disease that caused hypertension to develop must be cured or controlled. Long-term success depends on whether or not this is possible. If the cat has kidney, heart, or thyroid disease, it is important to treat those conditions aggressively. Hyperthyroidism is curable, as is thyrotoxic cardiomyopathy secondary to hyperthyroidism. Hypertrophic cardiomyopathy from other causes and chronic kidney failure are not. However, even those conditions can be managed successfully in many cats. If the cat has blindness due to detached retinas, an immediate medical emergency exists. Blood pressure must be lowered quickly in order to restore vision. If the retina(s) remain detached for more than a day or two, the prognosis is poor for a return of normal vision. Therefore, the key to a successful outcome is rapid diagnosis and early administration of medication to lower blood pressure. This entry was posted in Caring for your pet, News and tagged cats, feline. Bookmark the permalink. ← A New Mobile App For Your Pet!